MPAA Rating: R for strong crude sexuality and language, and for violence and drug content. As independent filmmaking grows larger, many of these projects seem to operate around the same set of themes. One of these themes is the "day in the life," the kind of story that takes a central character and shows you how odd or comical his life is through the course of one day. 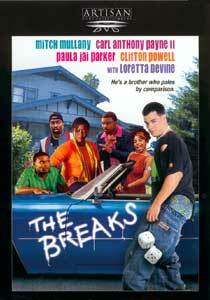 One example is The Breaks, the story of a white guy who "acts black" and lives in a predominately black neighborhood. The film is written by and starring Mitch Mullany, a comic who apparently has long used this "white-black guy" style for his standup and TV appearances. Not surprisingly, Artisan teamed Mullany with director Eric Meza (House Party 3). Mitch Mullany portrays Derrick, an Irishman adopted as a boy by a black family. As the film opens, we quickly learn that Derrick is an irresponsible misfit, and in a fit of exhausted rage, his mother kicks him out of the house. His mother tells him that if he can bring home a carton of milk before dinnertime, she'll rethink his punishment. While Derrick attempts to complete this simple task with his friend Chris (Carl Anthony Payne II), but along the way all sorts of random events conspire to make buying milk an improbability, including dealings with gangsters, angry convenience store managers and ex-girlfriends. Initially Mullany "acting black" is mildly humorous and cute, but as the film progresses, it becomes dreadfully stale. Mullany plays to the audience rather than to the characters surrounding him, who don't seem to care that Derrick is putting on this show, which seems to me an unusual direction to take the film, as it ignores his moronic behavior. I found more humor in Carl Anthony Payne's role as Chris—because it seemed more earnest. Getting used to Derrick is difficult, but it happens eventually. Despite much of the humor being juvenile and rather raunchy, the script has some bright spots when it drops its whole "urban" pretense and provides some subtle, funny moments. Occasionally the film turns to slightly more intellectual comedy (rather than how many expletives can be shouted in 30 seconds), but the laughs were few and far between. For me, these comedies are just too predictable. The box for the disc proclaims that the film is "in the tradition of Friday and Don't be a Menace To Society While Drinking your Juice in the Hood", but sometimes "in the tradition of" just means "we borrowed a lot." While they say there are no new stories, elements from the aforementioned films as well as others such as Clerks, Mallrats, and Can't Hardly Wait seem vaguely present. I'll admit, The Breaks has a lighthearted charm about it that's hard for me to criticize, but at the same time it seems its potential is wasted, as it overstays its welcome. For example, one part in the film satirizes Pulp Fiction, but instead of a quick reference, we get a lengthy scene that wears the joke thin. Overall, The Breaks is a fun diversion, but in the end it milks too many concepts for too long (no pun intended) to satisfy. Image Transfer Review: The image quality of The Breaks is up to the standards I'm used to with Artisan releases. The image is crisp and sharp with no noticeable compression problems. Colors and grays are all well balanced. Also worthy of mention is the fact that despite the anamorphic enhancement, the image has no aliasing problems on a 4:3 TV. Considering the disc is not dual layer, this quality is a sign that compression standards are definitely improving. Some segments of the film were done with different film stocks (like a scene in which Derrick "trips out") and those are slightly lower quality than the rest, but it certainly isn't a DVD mastering problem. Audio Transfer Review: The Dolby 2.0 soundtrack is adequate, but nothing special. Dialogue is well balanced in center, and most of the background effects are spread into the fronts. The only aspect of the film that really ever stretch the audio is the rap/hip-hop soundtrack, which bleeds into the surrounds a bit and adds bass to the mix. Since the film is heavily dialogue-oriented, there's little to complain about here. Extras Review: As far as extras go, the disc is pretty thin. I think this is actually the first DVD I've encountered that doesn't have at least an English subtitle track for the deaf and hearing impaired. The production notes on the disc are informative, but end up making the whole thing feel light. It's unfortunate that Artisan refers to things like scene access and menus as "special features" when, really, they aren't. The film seems demanding of a commentary track as well. Oddly, an unfortunate complication arises because the promotional materials included with the disc ruins the impact of the several cameos in the film by a variety of personalities, causing them to lack the humorous impact they might have had. While I thought the film a bit weak, it is still nice to see such an independent production, without big name stars and an expensive licensed soundtrack, the film showcases some budding talent with a bit of non-commercial dignity. The Breaks isn't great, but it's got an honest feeling about it , and a few genuine laughs—if you can get past Mitch Mullany's tiring performance. You may want rent this first before purchasing outright.